Kids' Book Review is delighted to welcome Kim Noble from Bookworld to share with us about the story behind the Bookworld Pop-up Book Shelves and your chance to nominate the next pop-up bookshelf location. Make sure you watch the video clip - we love the way a shelf full of books brought strangers together and started conversations. We have a bookshelf in the Bookworld office that gets a lot of attention. Mostly because all the latest and greatest books end up there way before they’re released to the public, but I don’t think the rainbow sorting harms things! One day we started talking about how cool it would be to take this bookshelf outside of Bookworld, where people least expected it, and see what would happen. And so we did. 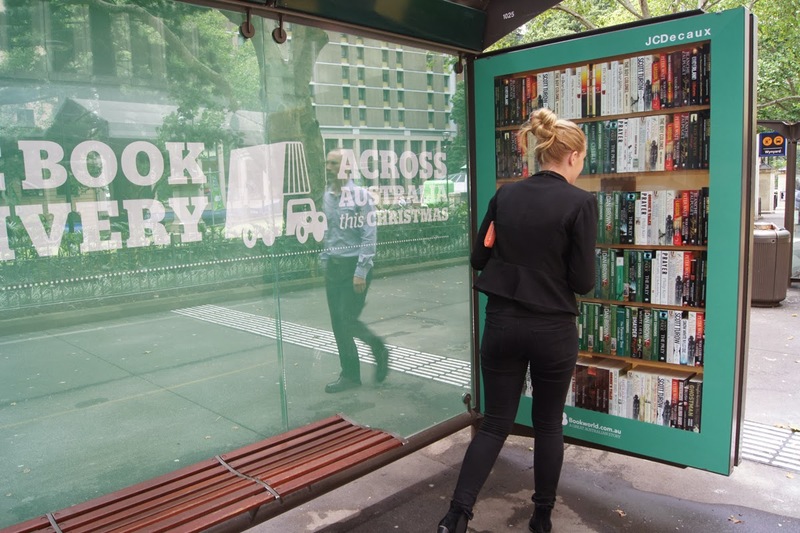 We created pop-up bookshelves in bus shelters in Sydney and Melbourne, filled them full of books, hid some cameras so we could keep an eye on things, and then let the passerby’s help themselves. You can take a look at what happened in this Bus Stop Bookshelf video. The response we received was overwhelming and we were amazed at how many people spent the time to browse the shelves (many even missing their buses! ), recommend books to each other and just take the time out of their busy lives to enjoy books again. We also got inundated with requests for us to bring the pop-up bookshelves to other areas. Which got us thinking. What if we took the pop-up shelves to some places that could really benefit from some free books. So we’re rolling the bookshelves back out (yes we’re nuts) but this time we’re asking Australia to tell us where we should go. For the next few weeks we will be taking nominations of any school, community group, town or area that could do with a truckload of free books delivered. So whether it’s your kid’s school that could really do with a library top up, or your local town that doesn’t have access to books, or even just your local group get-together that really love reading we want to hear about it. If we can remind a few people of the joy that can be had when you’re head down in a brilliant book then we’ll be very happy. You can nominate for your area today at the Bookworld website. Nominations are open from 10 February - 25 February 2014. Voting for three shortlisted entries will run from 27 February - 9 March 2014.